Ribeye. Blackened Ribeye. Black salt. Black pepper. Black garlic powder. Porcini mushroom powder. Smoked Paprika. Butter. Canola oil. BOOM! A party in your mouth!!! Need I say more? Well, okay, technically I do but this steak carries a name for itself all on its own let alone the flavor bang from a few unique spices and butter, glorious butter. Juicy, tender, succulent, fatty and umami to the max! Some may feel a bit intimidated when it comes to ribeye but this recipe is simple, packs in a heck of a lot of flavor and is delightfully filling. You can make this recipe quite quickly for a weeknight dinner or wow your friends with it during your next dinner party or summer BBQ! And don’t rule out steak for breakfast! I must admit that I have a steak breakfast at least once a month… packed with protein, it fills me up without giving me that ‘stuffed’ feeling and provides me with a steady surge of energy well into the afternoon. So who needs coffee for breakfast when you have ribeye?!?!!? If you’re on a special eating plan such as paleo, keto or low-carb, this ribeye steak can be the star of your show! The good thing is that this particular cut is so delicious that it doesn’t need much—you can opt to go classic with salt and pepper and you’re still in for the win! This recipe contains seasonings to blacken the steak and give it a rich and savory flavor profile. You can slice and grill onions along side the steak while its cooking which makes even more magic happen! I used a well-marbled grass-fed organic steak which produced such incredible flavor. The black salt (actually visibly a dull grayish pink) contains minerals that add complexity to the flavor of the steak itself and the rub featuring the black garlic and mushroom powder takes it over the top! Black salt, black garlic powder and mushroom powder can be found at a specialty spice shop or from a spice vendor online. Although delicious on it own, you can top this delicious steak with a fried egg and/or serve with a green salad, cauliflower or tomatoes grilled in the skillet you cooked the steak in! You got options! Enjoy! Remove the ribeye from the refrigerator an hour prior to cooking. Pat the steak dry with a paper towel and use your fingers apply black salt all over the steak until evenly coated. In a small bowl mix the remaining seasonings together then massage the rub on all sides of the steak. Allow the steak to sit and come to room temperature for at least 45 minutes while the salt and and other seasonings do their thing. Place a cast iron skillet over high heat, add canola oil and allow it to heat until oil begins to smoke. Using tongs carefully place steak in the skillet and allow to sear for 4 minutes and then flip the steak over and allow it to cook for another 3 minutes. If you prefer your steak well done cook steak for an additional minute on each side. Using tongs remove the steak from the skillet and place on a plate with butter on top and allow butter to melt into steak. Allow steak to rest for 5-10 minutes prior to eating. Enjoy! Cooking a steak under such high heat creates a lot of smoke so open your windows and doors and turn your vent on. This recipe instructs cooking a boneless ribeye steak until it is medium rare which produces delicious flavor for this cut, however feel free to add or detract a minute or so to achieve your preferred level of doneness. If you are cooking a bone-in steak cook for an additional minute on each side. 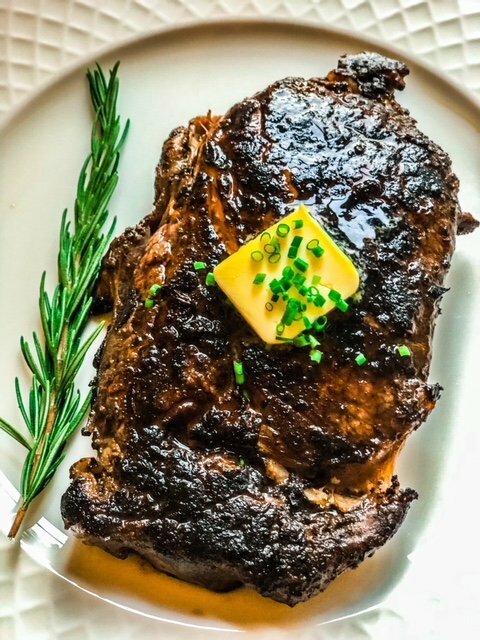 Ribeye Steak is a classic! This is making my mouth water. Can’t wait to make this recipe! I can’t wait to try the blackened ribeye and curried shrimp recipes, they both sound very delicious! Please do try it and let us know what you think! I love that it leads off with breakfast! Excellent taste! My favorite steak. Keep them coming EpiTherapist! Thank you! Please come back and see what we’re cooking up often! This steak looks so amazing and moist!! I have to try it! Now this looks simply amazing!! I can’t wait to try this! This made my mouth water! I always fail with cooking steaks so I will have to bookmark this post for later. Great tips! I’ve attempted to make Steak once (I believe it was Christmas last year), but this recipe looks so delicious! I love that it’s Blackened. I could imagine the amount of flavor that you get with each bite! Oh my goodness–what a stunning piece of steak!